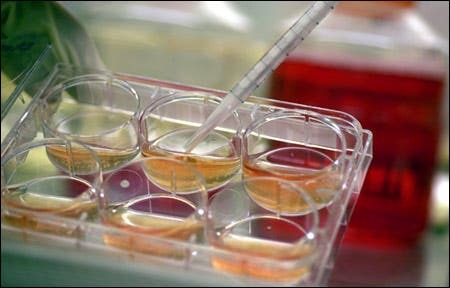 Human stem cells can remember what surface researchers have grown them on. This mechanical memory in fact influences the fate of these stem cells, such as whether they start differentiating into bone or fat cells. Basically, they remember if they were on a hard or soft surface, and this influences their future. This remarkable fact was announced at a presentation given on March 16 by University of Colorado materials scientist Kristi Ansethat the American Chemical Society meeting in Dallas. The work was also published in a recent report in Nature Materials (2014, DOI: 10.1038/nmat3889). Growing stem cells in a lab is not really a spectacular technology nowadays; it’s relatively common for researchers to grow them in labs. However, many view it as an art as much as a science. It’s been known for quite a while that in order to control the growth of the cells, you have to make the chemical growth environment just right, but this new study shows that the physical constraints of this growing environment, are also important. “Just as you would dose stem cells with chemical factors over time to direct differentiation, researchers should add the properties of the mechanical environment to their laboratory repertoire,” comments Wilhelm Huck, who studies cellular growth conditions at Radboud University, in Nijmegen, the Netherlands. “Nobody had studied whether cells could shake the memory of their past environments.”, he adds. Anseth’s team studied human mesenchymal stem cell, one of the major types of human cells. They found two proteins, called YAP and TAZ, that can modulate the cells’ mechanical memory. Interestingly enough, The YAP protein serves as a target for the development of new cancer drugs, while TAZ is highly expressed in cardiac and skeletal muscle. Both of them can activate gene transcription. When the stem cells are cultured on stiff beds, these proteins relocate from the cytoplasm to the nucleus. If they lay on the stiff bed for only a few days, then this change is not permanent, and tends to revert. But spending 10 days on a particular bed leads to irreversible future differentiation – and the same thing happens when they are placed on a soft bed. “I think this study will prompt many groups to consider with greater care the importance of their culture conditions,” commentsDennis Discher, who studies stem-cell culture conditions at the University of Pennsylvania.